Walton produced more marked figure forms than did any other manufacturer of his day. Unfortunately, Walton is routinely generously credited with a prodigious array of unmarked figures. Today, the words "Walton," "Walton-type," and "Walton-school" have become almost synonymous "bocage figure." As a host of plausible explanations exists for different potbanks producing look-alike figures, attribution of unmarked figures to Walton is seldom correct. The “walton” mark is in a ribbon applied usually on the back of the mound base, but sometimes beneath the figure. The letters are in uppercase with serifs and are usually impressed but are occasionally molded in relief. Both versions of the mark are believed to be John Walton’s because both can be seen on almost identically formed figures. Walton sometimes used a large rosette in the center of the decorative scrolls on the base of figures. This rosette appears to be unique to marked Walton figures. The bocage most common on marked figures comprises several five-fingered leaves. Each finger has four serrations along its approximately parallel edges. Flower forms vary. Sometimes, the leaves are arranged in an arc instead of a tree form. Many other potters also used this seemingly ubiquitous bocage leaf form. A broad-leaf bocage occurs on five marked figures only. (see numbers 11c, 12c, 18b, 27b, 48b in the Figures section). All figures with this bocage also occur with five-fingered bocage leaves. A palm-type leaf has been recorded on only three marked Walton figures. (See numbers 50b, 72b, 84b in Figures section). Two of the other bocage leaf forms recorded on marked Walton figures are known from one figure each. Walton used spill vases behind sixteen recorded figure models. Spill vases were used with or instead of bocage leaves. Walton used spill vases and bocages interchangeably on some of his figures. Thus, a figure group that occurs with a bocage may also be found with a spill vase. Note scrolling foliage in lieu of a bocage on the rear of this Walton figure symbolic of Spring. This is the only recorded use of scrolling foliage by Walton. This same figure group with scrolling foliage can be found on other bases (as below). In those cases, the figures are always unmarked and always lack the tell-tale rosette that appears unique to Walton. "Walton" is the correct attribution only for marked Walton wares. Unmarked figures bearing only a stylistic similarity to Walton figures cannot be attributed to Walton. Why do we repeatedly find a marked Walton St. Paul (number 13 in the Figures section) paired with an unmarked St. Peter? The figures can seem to have been made as a pair: sized and styled to stand beside each other, titled in an identical manner, decorative details (including bocages, grassy encrustations, and scattered flowers) match. Yet St. Paul is always marked, but St. Peter never is. So far, not a single St. Peter bearing the Walton mark has been found. Note that all other Walton figure pairs routinely have marks on both figures. Because all other figures in the two dozen-plus recorded Walton sets are marked, we cannot conclude that unmarked St. Peters are Walton. Why are there look-alikes of some Walton figures, but not of others? Unmarked look-alikes of Walton sheep can be found, but no unmarked look-alikes of Walton cows. Similarly, unmarked look-alikes of Walton bird-nester pairs occur, yet no unmarked look-alikes of Walton showmen or show-women. Any subtle differences between marked and unmarked examples are perplexingly inconclusive. Could some of the very many unmarked deer be unidentified Walton handiwork? Even though deer are the most ubiquitous of pearlware figures, we can record only two examples of marked Walton deer, both from the same figure mold (numbers 72a and 72b in the Figures section). Is the conclusion that only marked figures are attributable to Walton too simplistic? For example, what of the unmarked gardener groups that look so like other Walton figures? These groups only occur with bocage leaf forms used by Walton. 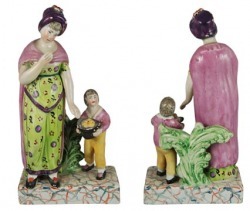 Their composition, scale, style, and color palette is reminiscent of other Walton groupings--but also typical of many other pearlware figures of the period. Lacking unique characteristics or a marked example, these groups remain unattributed. These Staffordshire figure groups are typical of the wares John Walton made. As not a single similar example marked WALTON occurs, we cannot attribute any one of these groups to Walton. Pearlware figures in this style were made by multiple other potters, making attribution of unmarked forms particularly perplexing.